I would not hesitate to say that Queens is the best borough to have dinner in. Or lunch. Or breakfast for that matter. Whether it’s Chinese food in Flushing, Mexican in Corona, Korean in Douglaston, Indian in Floral Park, or the lesser known Bukharian restaurants of Forest Hills, it’s no secret that the streets of Queens are teeming with authentic ethnic eateries. In addition to brick-and-mortar restaurants however, Queens is churning out exciting high-quality artisanal food from passionate entrepreneurs cooking out of a 5,000 square foot kitchen in Long Island City. 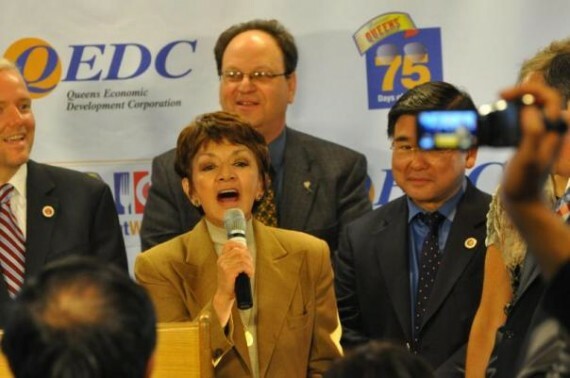 The Entrepreneur Space (referred to as the “E-Space” by those in the know) is a joint venture between the Queens Economic Development Corporation and Mi Kitchen es su Kitchen. This past Tuesday night, I had the privilege of attending the QEDC’s 10th Annual Queens Taste 2012, an incredible evening where over 1,000 people celebrated the food of Queens at Caesar’s Club at Citi Field. The 47 vendors included many businesses from the E-Space, and I was thrilled to be able to talk to the chefs and visionaries behind the ventures. It doesn’t get more sustainable and local than the Astoria-based company Beyond Kombucha. Started by Astoria-native and self-proclaimed “Tea Snob” Spiro Theofilatos, the kombucha churned out by this company is powered by the 3rd largest private solar field in NYC! Kombucha is an effervescent fermented tea beverage made with tea leaves and herbs. While most comercial kombucha is formulated to remove the alcoholic byproduct of the fermentation process, Spiro being the purist that he is refused to compromise the integrity of this ancient beverage, and instead went through the process of becoming the first NY State and federally-licensed kombucha brewery on the East Coast. Now the very slightly alcoholic (1.5%) drink can be sold legally with it’s authentic flavor intact…And that flavor is delicious! 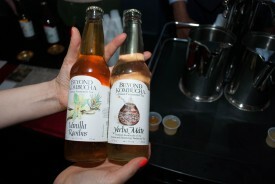 Tuesday night, he and his team were offering 2 of their spring 2012 flavors to taste including Yerba Mate and Vanilla Rooibos. While both were refreshing, I preferred the Yerba Mate’s herbaceous and appley profile, but I can imagine sipping on the Vanilla Rooibos with dessert. Kombucha is a naturally fermented and “live” product, and all the good bacteria (probiotics) inherent to the fermentation process are wonderful for your digestion. I often suggest incorporating fermented foods to my patients struggling with digestive issues, and I will definitely include Beyond Kombucha in my recommendations moving forward. Josephine’s Feast is a small-batch jam and preserve maker. I had heard about the company a few years ago, when Food Curated made a 6-minute video about the founder Laura O’Brien’s thoughtful and artisinal approach to preserving seasonal fruit. I had the chance to speak with Laura’s husband, Sean, and was thrilled to hear how the company has expanded in the past few years. They still have the sweet jams, but have branched out into a variety of marmalades and mustards. While they source as much fruit as possible from farms near their home on the East End of Long Island and in upstate New York, they were tasting 4 marmalades made from seasonal winter citrus form California. 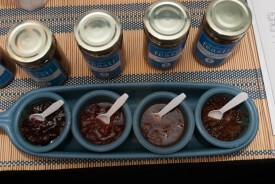 Of the four marmalades that Sean was sampling, I enjoyed the Thick Cut Blood Orange Marmalade the best. The marmalade was a beautiful, rich and vibrant scarlet color which would pair wonderfully well with a sweet butter or soft cheese. 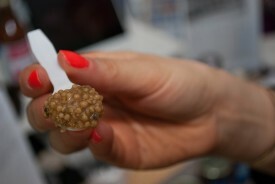 Of the mustards, I loved the whole grain mustard with lemon, sage and chablis. Throw a bit of that in a vinaigrette, and you’ll immediately be transported to Provence! If being transported to a tropical paradise sounds more like what you’re after, I recommend snacking on the dried fruit creations of Blanca Lilia Narváez’s Tropisec. 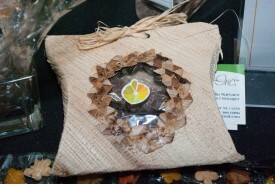 Based out of Long Island City’s E-Space, Blanca was inspired to start Tropisec when she missed the natural, sun-sweetened dried fruits of her native Columbia. She sources her raw ingredients from a Columbian co-op that supplies her with all organic, dried fruit, which she artistically arranges into edible sculptures. She employs women in Columbia, many of whom were displaced by domestic violence, to make her natural banana-leaf packaging. 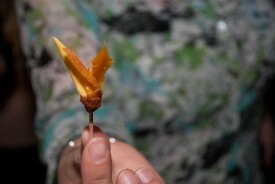 Once you’ve tasted these sweets, you will understand why the Queens Taste 2012 jury awarded Tropisec the best dessert. I tried a sundried banana bite dusted with cocao powder which packed real intense banana flavor, and a whimsical papaya flower. Both were unique and delightful. If you are looking for something unique for the moms in your life, you can order Tropisec’s fruit creations on their website. Overall it was a fantastic event, and it was inspiring to see the many diverse food pioneers right here in my back yard, as they work to uphold Queens’ reputation as the BEST food borough. Great job, LIz. 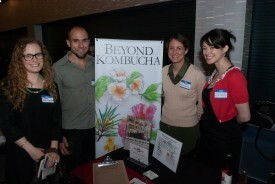 Beyond Kombucha must love you!!! Great event, I organise a similar meeting in Poland. Thanks for sharing all this information. It has inspired me to change some parts of my event. I might have to look forward to taste the winning dessert recipe by Blanca. Surely it’s one of a kind.